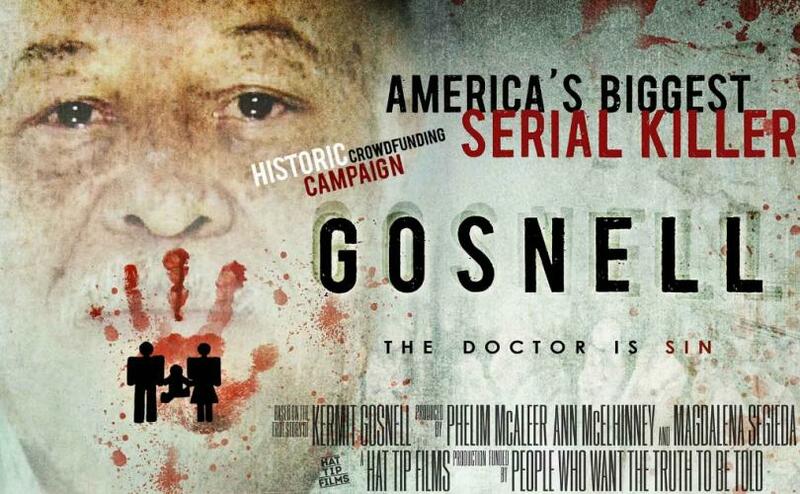 Gosnell: A Movie About America’s Most Notorious Serial Killer. And Why You Don’t Know About Him. I got to see an advance screener of this new amazing movie coming out in October. Keep your eyes open for it. I’ll remind you on this blog when it’s out. Right off the bat, this is NOT a pro-life political movie. It is a detective legal drama about a serial killer and how justice was delayed for a criminal monster. It is a movie about the cover-up of crimes and how the system and political bias of those in power feed that cover-up. This is no different than Erin Brockovich, Michael Clayton, Spotlight, The Insider, The Verdict, A Civil Action, China Syndrome and many other Hollywood conspiracy movies. The only difference is that Gosnell is about a politically incorrect villain so you would have never had the opportunity to see this unique movie if it were not for the brave, courageous storytelling of its producers, Phelim McAleer and Ann McElhinney (They also wrote a NYT Bestselling book by the same title). I have mentioned previously on this blog that I have had the privilege to work with them and I believe they are two of the most heroic storytellers in filmmaking today. Secondly, this is NOT a gross-out horror movie (though it could easily have been). There are no in-your-face grotesque images of what Gosnell actually did. Yes, creepy images at times, but not gruesome. The director, Nick Searcy, had the creative foresight to understand that it would take the focus off the amazing story and turn off their mainstream audience. It would also get them branded as “Anti-abortion propagandists” by the Media Goliath. This movie is no more explicit than an episode of most television legal or detective procedurals. True story of the Granite Mountain Hot Shots, an elite group of firefighters facing one of the worst fires in Arizona. I have big deadlines and don’t have the time to give to this that I wish I could. But I just wanted to say that this film has an essential quality that I have not seen in a loooong time in movies: a real heroic masculinity. I’m not talking about fake karate fights and sci-fi effects and comic book silliness. I mean the kind of heroism that inspires you to be a strong man in the self-loathing, self-destructive society that we live in. If you are sick of the infantilization of colleges, the sexist attack on masculinity by feminism, the attempt to emasculate all males based on the sexual depravity of some in power, the agenda to destroy God’s image by gender confusion, and the outright cowardice of our politically correct, SJW society, then you must see Only the Brave. It highlights not merely bold, gritty courage and bravery in men, but it gives honor to their women, and even shows the men’s flaws and how they seek to address them to become better husbands and fathers and role models. Heroism, courage, love, comradery, maturity, masculinity, it has it all. And we need it all. Here is an opportunity to do something active regarding changing our culture for the better. Phelim McAleer and his wife Ann McElhinney, are the most boldly courageous filmmakers I have met. I am working with Phelim on a project so this is very personal to me. This is not just an idea or a distant and cold cultural observation. They spoke truth to the power of Big Green by making the documentary Frack Nation. This doc uncovered the malicious lies of the anti-fracking movement and “documentary” Gasland. They raised their own funds through Kickstarter to make it. It’s now on Netflix and Amazon Video. They showed the truth about fracking, that quite literally has saved our nation. Phelim and Ann made history by raising their own funds of a couple million dollars to make a feature film (and book) about America’s worst serial killer, Hermit Gosnell. The press and everybody ignored this monster because he was an abortionist who engaged in infanticide. You read that right. Infanticide, not merely abortion. I’ve seen the movie, called, Gosnell. It’s a good movie. And it’s a courtroom drama, not a politicized piece. It has no gruesome pictures. It’s about the humanity of those who uncovered his dark crimes. But no distributor in Hollywood will touch it, because, well, Infanticide is a woman’s right to the Left. So Phelim and Ann are raising their own funds to distribute. The New York Times suppressed their book about Gosnell from their best-sellers list, because, well, infanticide is a woman’s right to the NYT. A Clear Lens Podcast: I just can’t shut up about Silence or The Shack. Take a listen to us talk about The Shack and Silence on their podcast here. The true story of the positive influence that African-American women had on the success of the early years of NASA’s space program. WOW. Watching this movie made me tear up with hope over the heroic dignity of its characters more than I have in a long time. (Well, actually, Hacksaw Ridge moved me as much, but before that, not in a while). We follow the stories of three particularly brilliant young black women: Katherine Johnson, played with graceful fortitude by Taraji Henson; Dorothy Vaughn, portrayed with courageous strength by Octavia Spencer; and Mary Jackson, played with witty womanliness by Janell Monae. The three are friends whose mathematical intelligence is each off the charts, but whose status as black women in 1950s America does not afford them much opportunity for advancement or success, as they face the prejudices of a society that still needs change in its treatment of women and the black community. As the women go to work at NASA, we see them face the everyday prejudice of segregated “colored” water fountains, bathrooms and schools. But also, they suffer under the compounded factor of women in a male-dominated workforce, where they just don’t have the respect they deserve. The title of the movie, being a clever double meaning of how these women, along with many others, were “hidden” in the background of the achievement of America because of social prejudice.